We plan to serve these, along with some of Game of Thrones inspired recipes, at our viewing party for the premiere of season 8 on April 14th! Combine cream cheese, cheddar cheese, cumin, and salt in a bowl. Mix well. Cut tops off small peppers and clean out the seeds. Stuff peppers with the mix from the bowl. Wrap peppers in bacon. Secure with a toothpick. Perfectly paired with King Joffrey the Ursurper’s Poison Sipper Cocktail! For the last year, my family has been living the keto lifestyle. 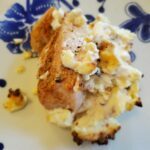 We have come up with lots of delicious and easy keto recipes along the way. One of our favorites for when we are entertaining are these Bacon Wrapped Peppers - they are stuffed with a cream cheese filling that is similar to the filling in our Keto Stuffed Pepper recipe, which are also a hit. Wrap peppers in 1-2 slices of bacon depending on size of pepper. Secure with a toothpick.